St. Jakob am Arlberg is a small hamlet close to the largest ski resort in the Arlberg area - St. Anton. St. Anton has hosted the Alpine Ski World Championships in 2001. 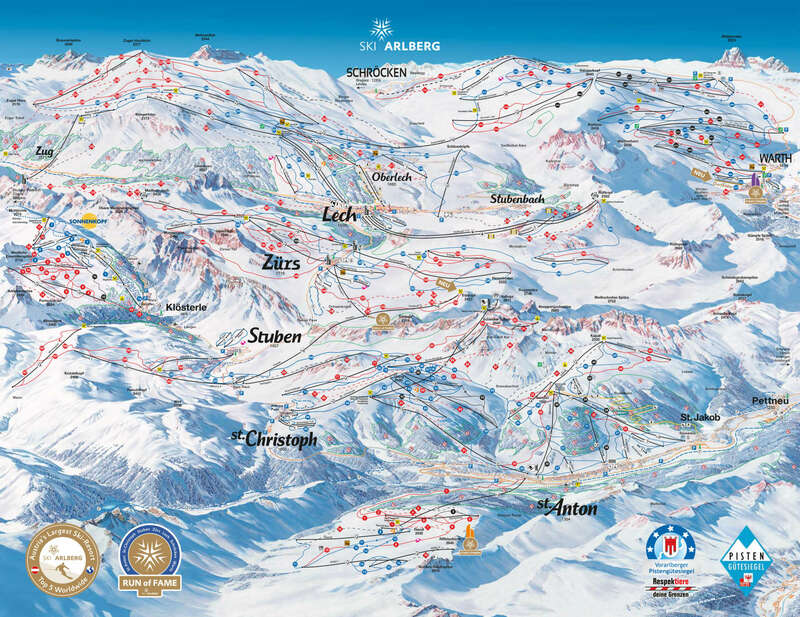 Arlberg ski area is Austria’s largest contiguous skiing area with 305 km of downhill slopes for all ability levels, 200 km of off-piste terrain and 87 lifts and cableways. In addition, other attractions include snowboard fun parks, carving areas and permanent racing circuits. Besides St. Jakob am Arlberg, St. Anton also includes Lech, ZÅ±rs, St Christoph and Stuben villages. St. Jakob am Arlberg the neighbouring village of St. Anton am Arlberg, is located in Tyrol, Austrian alps. St. Jakob am Arlberg, St. Anton am Arlberg and St. Christoph belong to the Austrian state of Tyrol, while other ski areas of Arlberg ski region such as Lech, Zürs and Stuben are part of Vorarlberg province. St. Jakob am Arlberg is a quiet place comparing to its neighborhood St. Anton am Arlberg, it is situated just down the valley and is accessible to skiers thanks to the new Nassereinbahn gondola. St. Jakob am Arlberg offers mainly guest houses, more accomodation available in nearby St. Anton am Arlberg. You will find picturesque ski chalets, hotels and pensions with exclusive facilities such as spa area there you can relax after the day on the slopes. There are a numerous restaurants and cosy meeting places in the area, as well as great shopping possibiliies. St. Jakob am Arlberg has everything for your perfect ski holidays! There is a train station in St. Anton am Arlberg, which is only 3,5 kilometres and 6 minutes drive from St. Jakob am Arlberg. Although Austria is famous for its efficient rail network, we recommend you to order direct airport transfer to get to your choosed destination. That is the most convenient anf time saving option. We always calculate all resort transfer services individually, to ensure that our customers never overpay. Whenever you choose to travel and whatever is your final destination, Alps 2 Alps will get you there for the lowest possible price. However, we advise booking early to access the best possible deal. In addition, keep up to date with Alps 2 Alps for the latest offers, hot deals and discounts on St. Jakob am Arlberg resort transfer services. All of the above will only ever result in our base-rate for ski transfers going down – we never over-inflate our prices at any time or for any reason. We also offer substantial discounts for off-peak, off-season and midweek transfers to St. Jakob am Arlberg. If looking for the best possible deals, travelling outside peak season or midweek typically results in the biggest savings. We offer midweek (Monday to Friday) prices with up to 60% discount than weekend prices. Your transfer quote will also depend on vehicle availability, transfer schedule, vehicle utilisation and other costs like road tolls and airport parking charges. In all instances, we work hard to keep our prices low and are relentlessly committed to total value for money. Which is why we guarantee you won’t find a better deal on your St. Jakob am Arlberg resort transfers, whatever your needs. The resort of St. Jakob am Arlberg lies at an elevation of 1,745m, with a max vertical of 1,507m and its highest lift going as far as 2,811m. St. Jakob am Arlberg has direct served by masses of 33 ski lifts and gondolas. 51km of blue pistes serve the needs of intermediates, 68km of red pistes are good for advanced users and the remaining 51km of black slopes are far more challenging. There is a Snow Park in St Jakob am Arlberg. Don’t forget that St. Jakob am Arlberg belongs to The Arlberg ski area, the greatest winter sport areas in Europe. The appropriate ski pass will allow you to ski and snowboard in other villages of St. Anton, St. Christoph, Zürs and Lech. Ski area offers great skiing possibilities, there are ski and snowboard instructors and mountain guides. St. Jakob am Arlberg is a resort for the whole family! Nearby St. Anton am Arlberg has kinder garden for children starting with age of 2. Professional ski instructors will teach your kids how to ski. Each participant of children’s ski school will receive a performance pass at the end of the course. From our point of view, St. Jakob am Arlberg resort transfers are about so much more than getting you to your final destination. Besides just getting to your destination, you also want to arrive comfortable, refreshed and ideally on time. Not all resort transfer services can promise this – Alps2Alps guarantees a higher-level service for every passenger. Be aware of all kinds of deals, discounts and special offers that could make your trip even more affordable. If looking to secure your seats for the best possible price, booking as early as possible is advisable.